Waai puzzles! Akari loves puzzles! I use waa.ai regularly as my URL shortener for twitter. Why? Because it’s awesome, that’s why. But really, why wouldn’t you? Waai puzzles! I love puzzles! Clicking on the picture leads to this, which looks like Morse Code. Pretty straightforward. Into a Morse Code translator you go! 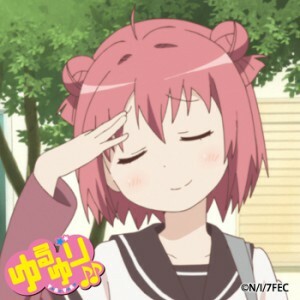 That leads to this, which has links three pictures of the lovely Akarin. Each of these pictures has a number, which can be seen in one of the pictures. So the natural thing to do is to take each of the pictures, arrange them in chronological order based on which episode it comes from, line up the numbers, convert to hex, ??? ?, profit. Crap. Maybe it’s in reverse order? I wonder what episodes these pictures come from? Maybe they have something to do with it? Might as well try. 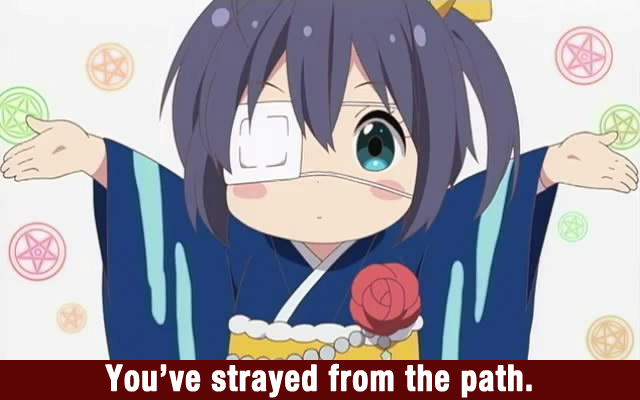 That leads to this. Alright, looks like there’s an encoding of some sort. Probably a simple substitution cipher, right? By making some guesses (it’s probably an imgur link, which means that the file format is .gif, which means that the phrase is probably something like “one of these…”) you can decrypt most of the letters. A tineye search tells me that it’s Christopher Poole, AKA moot AKA dat 4chan dude. Sweet, I got a lead! Now, let’s use those numbers from earlier! Alright, let’s google “4chan 5 19”. “5/19/13 Expect Us”? “Operation Apocalypse“? This must be it! There’s no way that this is a coincidence! Alright, let’s use “OA” in combination with waa.ai! I know the hint was “one of these things is not like the other”, but hey, maybe there’s something here? (an hour or so later) Dammit, alright, let’s look at the imgur page for these images. …oh, it was posted 10 months ago. There’s no way that’s relevant. Hmmmm… “fine” has gotta be relevant to this somehow. What happens if I google “fine cipher”? A… fine… cipher. Affine… ah. Aaaaaah! That’s what the 5 and 19 are for! Alright, let’s look at each of the imgur pages for these. The dark background of the page reveals some hidden text that the direct link doesn’t. And there you have it. 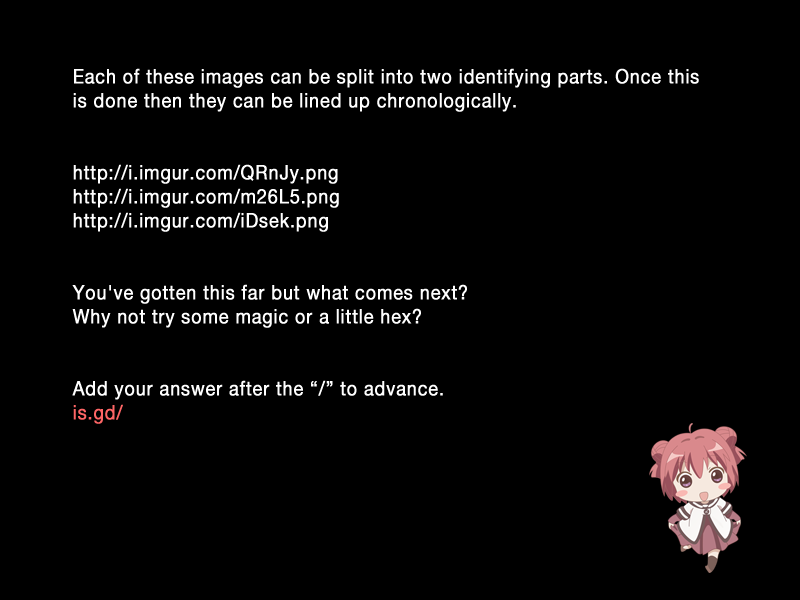 Turns out this Challenge was (surprisingly) not related to 4chan nor Operation Apocalypse at all. 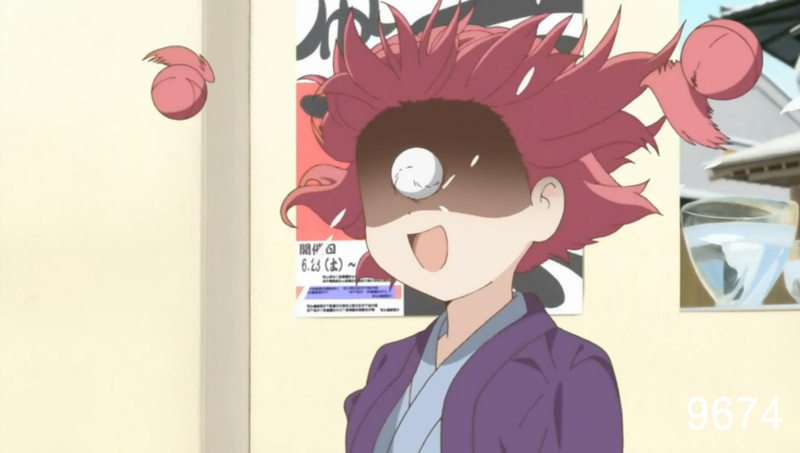 I’m totally gonna make a light box and take pictures of the Akari nendoroid! Believe it! 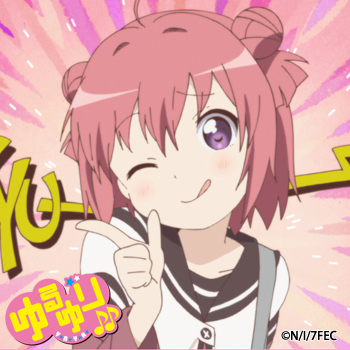 Tagged with akari, puzzles, yuru yuri.